The "natural rate of interest" is an analytical concept which is embedded in mainstream approaches to economics. Modern Dynamic Stochastic General Equilibrium (DSGE) models are built around the importance of interest rate (including expected interest rates) and the central bank's setting of those rates. If you are willing to assume that mainstream macro is correct, it provides a way of looking at the world. For example, "secular stagnation" (slow growth) can be blamed upon the natural real rate of interest falling to a negative value, leaving central banks unable to stimulate the economy. However, if you are less willing to assume that mainstream macro is correct, and would like to test the efficacy of interest rates for steering the economy, you will run into a severe problem. The way that the natural rate of interest is currently conceptualised means that it can explain any observed economic outcome; that is, it is non-falsifiable. As a result, there is no point in trying to prove modern mainstream macro as being incorrect; that task is impossible. The only way forward is to ask whether modern macro can make an useful predictions (as opposed to fitting historical data); I would argue that there is little sign of any such predictive power. Standard New Keynesian DSGE models are driven by a few state variables, many of which are not directly observed. The "output gap" is a measure of whether the economy is full capacity or not. If the output gap is positive, the economy is assumed to be growing faster than "potential," and so there should be upward pressure on inflation ("all else equal"). The output gap cannot be directly measured, but it is typically assumed to be the difference between current GDP and a state variable "potential GDP," which can then be estimated using some technique. It should also be correlated with directly measured variables, such as the unemployment rate, industrial capacity utilisation. Correspondingly, the implied "output gap" calculated by a model can be compared to economic data, and one can debate whether or not the reading makes sense. Expectations variables, such as inflation expectations and interest rate expectations. These can be taken from fixed income markets (assuming that we can deal with various risk premia embedded in fixed income pricing) or surveys. As a result, these variables can be treated as directly measured. The role of the natural rate of interest is what leads to my argument that mainstream macro is non-falsifiable. As noted above, we could look at the estimate of the output gap, and we could reject it based on how is compares to other economic data that are measuring aspects of capacity utilisation. Meanwhile, expectations variables are pretty much directly observed, although we need to account for biases. The problem is the natural rate. There is no reason to believe that it should be any particular value at any given time, and so there is no way of rejecting the estimates. 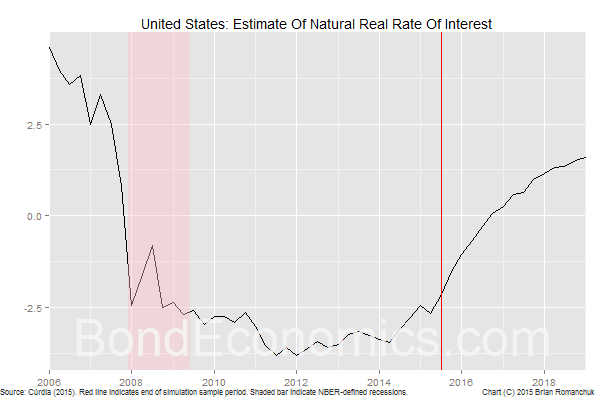 What the chart shows is that the estimate was near historical conventional estimates of the real natural rate (above 2%), but then dropped like a rock below -2.5%. Since nominal rates cannot go below zero and inflation has been low and stable (1-2%), it is impossible for the actual policy rate to be below the natural rate of interest. This has led to well-known anguish amongst New Keynesian economists. It must be kept in mind that this was largely not predicted. Before 2007, the standard argument amongst New Keynesian economists was that the 1970s inflation was the result of the central bank keeping the real policy rate negative for a period of time. Since the natural rate is allegedly based on the optimising choices of a representative household, and negative time preferences make little sense, a so negative policy rate should obviously be stimulative. This caused the consensus expectation of a rapid recovery fuelled by extremely stimulative monetary policy. As anyone who was short duration from 2010 on could tell you, the recovery was anything but rapid. It was only in retrospect that the estimated natural rate was revised lower. The DSGE methodology does not really offer useful predictions about the economy. The models can be used in "back-casting" -- explaining what happened historically. However, we could read Zero Hedge and get much more entertaining stories explaining economic outcomes. But in order to predict the future, we need to forecast the natural rate interest. Since we have no way of making such predictions, the models are broadly useless as forecasting tools. This uselessness calls into question the "scientific" basis of modern macro; generally speaking, science avoids the use of non-falsifiable models. To be fair to Vasco Cúrdia, his paper does not delve into such metaphysical debates; instead he is dealing with other topics that are of extreme interest to fixed income analysts. To summarise, he is providing justification for an extremely gradual pace of policy rate renormalisation. This should be of interest to any bond bulls out there. I seriously doubt that Cúrdia even thought that readers might question the importance of interest rates in determining economic outcomes, and so there is no material which responds to my criticisms here. Given the lack of hard evidence either way, the question of how important interest rates are for steering the economy is largely a question personal beliefs, such as the choice of a favourite sports team. The advantage of post-Keynesian economics is that there is an openness to question the role of interest rates; within the mainstream, the answer is assumed and methodologies are locked in the grip of circular logic. You write " If the real policy rate is above the natural rate, it is assumed that economic growth will tend to decelerate." Is this really what you meant? I would think it is more conventional to see the relationship between the interest rate and the level of output -- if the interest rate is above the natural rate, output will be below potential and *inflation* will be falling. Your formulation is arguably more realistic, but I don't think it's the standard one. I agree with you about the non-usefulness of DSGE models but we should be clear that the natural rate approach is broader than DSGE and does not depend on it. DSGE says, basically, that we should abstract away from business and think of the evolution of the economy over time as the result of a representative household choosing the optimal path for consumption given the tradeoff between leisure and consumption. The interest rate then operates to ensure that the consumption path actually chosen is the same as the path of output. Tee natural rate idea is much more general -- it simply claims that there is *some* substantial component of expenditure whose responsiveness to interest rates is strong enough, and reliable enough, that we can think of output as a negative function of interest rates; and that there is stable monotonic relationship between output and inflation such that we can identify a unique level of output consistent with our inflation target. This may well be unrealistic for various reasons, but it is a much more general claim than DSGE and doesn't depend on the strong (and IMO absurd) idea that output fluctuations are based on intertemporal allocation of consumption out of a known lifetime income. The other issue with the natural rate of interest approach is that it ignores all the other factors that influence aggregate expenditure and assumes we can go straight from the "fundamentals" to the natural rate. But obviously, the interest rate consistent with a given target level of output will depend on the current government budget balance, the trade balance, etc. The deeper issue here is the effort to reconcile policy-oriented macroeconomics with the Walrasian models taht are the heart of academic economics. In those models (and in particular in the Euler-equation based Ramsey-Samuelson-Solow growth models that are the heart of academic macro) the "interest rate" represents the utility-maximizing price of present relative to future consumption. As i've written ad nauseum on this blog, there is simply no connection between this concept and the asset yield that we normally call an interest rate. The natural rate concept is a way of papering over this gap. I wrote the description of the effect of interest rates without looking at the equations, and so I was fairly loose. (The paper I cited actually gave a description, I probably should have just quoted it). However, as the "neo-Fisherian" debate within DSGE macro shows how difficult it is to interpret what is happening with interest rates within those models (raising rates raises inflation). I agree that the natural rate can be more general than pure "DSGE" macro; I just used the term as being a shorthand for modern mainstream macro. I am only somewhat familiar with the history of the concept, and it is unclear how those earlier formulations could be tested. If the natural rate was seen as being largely constant, it does not appear to fit observed behaviour. I love that quote. Great to know that central bankers occasionally see the light." This is just a complete exercise in Monetarist cluelessnes. It is unclear whether Volcker actually believed that he set the money supply and the market determined the interest at the time of the quote; he may have just said Monetarist nonsense to keep the academics happy. But even if he thought so when he said that, central bankers rapidly figured out that they could not control the money supply, all they could do was set interest rates in order to try to hit money growth targets. And even if they hit those money growth targets, it did nothing useful for regulating the economy. And in systems where central banks pay interest on deposits at the central bank ("reserves"), the overnight rate is obviously administered. I think it's pretty clear that Volcker knew better, but that he found it politically useful to attribute high rates to "the market." Greider's stuff and especially Krippner's capitalizing on Crisis (ch. 4 I think) are good on this. Nice post. I'd agree with most of JW's comments. The main issue I have on the usefulness of the natural rate concept is that, even if there is in fact an interest rate which at any point in time will secure full employment, we should not expect that rate to be stable. Changes in interest rates generally lead to changes in the pattern of debt which in turn change the future response to the interest rate. This doesn't show up in simple representative agent models where there are no lenders and borrowers and so no debt pattern. Right. Again, to me, the real problem isn[t the idea of a negative relationship between interest rates and output, or a positive relationship between output and inflation. It's the idea that the interest rate consistent with constant inflation is determined solely by technology, demographics, and other slow-changing "fundamentals." And if it is not "slow moving", what use is the concept? We were told by central bankers that they could regulate the economy solely with interest rates, and we have various nuts screaming about abolishing non-electronic money so that we can get rid of the zero bound. Meanwhile, there is not a whole lot of evidence that low interest rates actually help growth. If they can just say that whatever the level of interest rates are, the natural rate just always happens to be just a bit lower, why should we believe them? Define a target level of output Y*. Assume a semi-elasticity of of output with respect to the "real" interest rate of e. Then if the current interest rate is i, the natural rate i* is i + (1/e)(Y-Y*/Y*). So for instance if you think output is currently 5 points below potential, and you think a 1 point fall in interest rates produces a 2 percent increase in out, then the "natural" rate will be -2.5. as far as i can tell, this is the procedure followed in all these empirical estimates, tho of course you can complicate things in various ways, especially by using a more complex target then just a given level of gdp. As a practical matter, when a central banker says "the natural rate has fallen" all it means is "I think interest rates should be lower," and conversely for "the natural rate has risen." now and then they'll say that point black -- I had a conversation with the top economist at the Bank of Thailand a couple years ago where he explained it in almost exactly those words.